I still remember the very first time I held an Ikea catalog in my hands and flipped through its pages. It was 1999 and the cover was a well-lit living room with a mother and son lying comfortably on a beige couch. I browsed and found myself amazed by the room layouts and colors. I didn’t know then that the magazine was teaching me a few design basics that I eventually learned more thoroughly about. Here’s a few things you can pick up from that Ikea catalog you keep ignoring on the center table. Over the years, Ikea has evolved from the basic colors of the 1940s down to the roaring brights of the 2000s. The Ikea catalog will help you find the right color combination suited for every need and personality. Think neons won’t match? This catalog will make you rethink your decision. The Ikea catalog aims to show us what their products are capable of—and how they can be used to design your dream home—as if each piece has its own story. Don’t forget that these pieces of furniture are set in such a way that they will look appealing, which means you’re not just learning interior design and layout, but also commercial photography. Nope, this photo isn’t asking you to spot the difference. These 3 seemingly identical photos were tailored to fit different regions of the world. The handles are different, some have 2 ovens, and the sink changes. It teaches us how to customize our work depending on the client and audience. This is good news for 3D artists and possibly a warning for consumers. Ikea’s IT manager, Martin Enthed, revealed that 75% of the photography in an Ikea catalog includes computer-generated images. Since 2006, they have been using 3D modeling to make products look perfect in the catalog with just the right amount of light and shading because let’s face it — it’s hard to stage an entire set and achieve proper lighting. 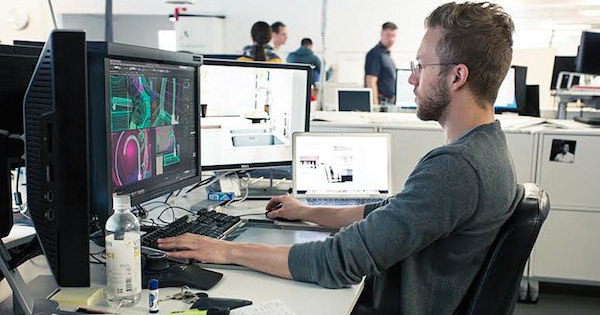 As designers, we either live in a messy household or an extremely neat one. Either way, we can take notes from the catalog because it shows different ways on how you can be neat without being a freak. Organizing doesn’t only apply to your workspace; it may also apply to the layers named Layer 1 and Layer 1 copy on your PSD file. The dreamy images of rooms—as seen in the Ikea catalog—serve as gentle reminders of what you want for yourself. The images teach you to dream big and work hard in achieving that goal. The catalog is like some sort of basis for what an adult should be living or working in and if the images don’t come close to where you’re at, it’s time to flex a little more muscle. Designers usually sketch before going in. We plan before we plot. The Ikea catalog is extended through a mobile app that lets you virtually place a piece of furniture into your own home. This encourages visualization of elements, like adding photo filters or scaling logos. It reminds us of the freedom we have as designers to either add or subtract as we wish.